A stair lift can be a way to reduce mobility issues for seniors. As we age, we can find it harder to get around. It’s common for the elderly to experience aches and pains getting out of bed to not being able to climb stairs. A decrease in mobility can be stressful for seniors and caregivers alike. Mobility issues can be a major issue for the elderly, and it can lead to social and psychological problems. Those consequences can be avoided by installing a stair lift. Read on for five other reasons why they can lead to increased freedom for seniors. Experts say that your first priority in caring for seniors is fall prevention. With a lift, you will prevent someone from falling down stairs. There’s also no need to have a major renovation. Stair lifts can be installed in any staircase and are quick and easy to install. They attach to an existing stair rail. They can also fit any budget, which can save you money. If you’re in a split level home, and can only access one level, you’re cut off from half of the house. From a senior’s perspective, they could only access one or two rooms in their home. With the installation of a lift, they can access the whole house. They can still do chores, and feel like they’re still making a contribution. That can have a big impact on someone’s emotional well-being. Studies have shown that the more independent and active seniors are, the happier they are. The more active they are, the more independent they are. They feel more capable and want to participate in other activities. Without a way to get around the house safely, the elderly can feel cut off in their own home, which can lead to depression and loneliness. A lift can relieve stress for caregivers, too. It can be so difficult to move someone up and down stairs safely, caregivers may avoid it altogether. 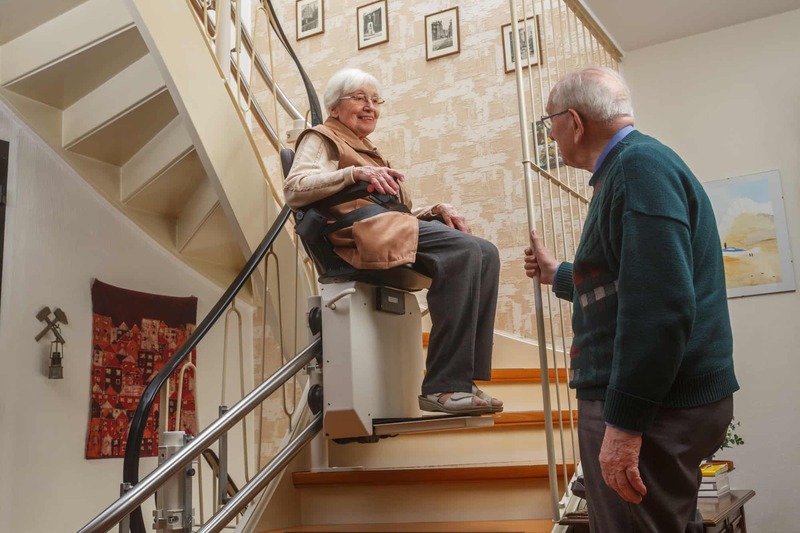 A lift will give caregivers an easy way to safely move an elderly person up and down stairs. Secondly, a stair lift will relieve the stress of caregivers having to constantly go up and down stairs. Moving from a known environment into a nursing home can be stressful for anyone. Lifts can keep the elderly in their home longer just by providing access to the entire home. Sometimes, seniors have to leave the home that they have been in for years simply because they can’t safely navigate the staircase. Installing a lift will eliminate that concern. A lift provides many benefits for seniors, not to mention increased freedom around the house. Access and Mobility is committed to helping families and businesses create accessible environments. Do you have questions about installing one in your home?